Golf is a club-and-ball sport played by people of all ages, both for competitive and leisurely pastimes. While it is an enjoyable sport, the repetitive motions required of the wrist, hand, and elbow can cause overuse injuries. Striking the ground, a rock or a root behind the ball can cause tearing of ligaments and tendons. The most common injury sustained while golfing is called Golfer’s Wrist. Golfer’s Wrist refers to a break in the small projection of the triangular-shaped hamate bone, which is located in the palm near the wrist below the pinky and ring fingers. The hamate bone is one of eight carpal bones in the wrist. The hamate bone may be injured after experiencing abnormal stress of trauma resulting from golf. Point tenderness on the hypothenar eminence and a weakened grip are both characteristics of hamate fractures. Patients present with pain and tenderness over the hamate. Tendinitis and traction on the fracture may present with weakened grip, inflammation, and pain when flexing the hand. If you experience chronic or acute pain before, during, or after playing golf, it is important to see an experienced hand surgeon to get a proper diagnosis and treatment plan so that you can continue to enjoy playing golf safely. Golfer’s Wrist, fracture hook of hamate, before and after surgery. Occurring most often in golfers and batters, whose palms repeatedly absorb the shock of club- or bat-to-ball contact, Golfer’s Wrist can develop over time as a receptive trauma injury or suddenly in a more traumatic instance. Inflammation of the central extensor tendon of the wrist, the extensor carpi radialis brevis, can result from hitting the ground. Primary symptoms of golfer’s wrist include palmar pain and difficulty grasping things in the hand. Injuries sustained while golfing can be painful and long-lasting. They are sustained due to long-term overuse of the hand, wrist, and elbow, or can be the result of acute trauma. There are two common injuries associated with Golfer’s Wrist, which involve fractures or tissue swelling. Hook of Hamate Fracture: A fracture of one of the eight carpal bones located on the ulnar side of the distal carpal row. Fractures of the hamate are unusual due to their location. They can be confusing to diagnose and treat due to the complexity of their structure. Tendinitis: Inflammation or irritation of a tendon. This condition causes pain and tenderness just outside a joint. This is one of the most common injuries sustained while engaging in any sport, though golfers will experience it primarily on the back of their hand and wrist. The outside of the dominant elbow may become inflamed, lateral epicondylitis, or the inside of the non dominant elbow, medial epicondylitis. 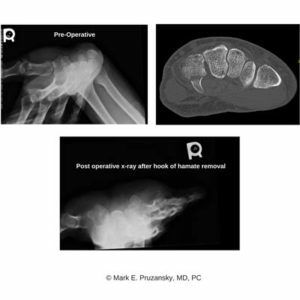 An X-ray image may confirm displaced and minimally displaced fractures, which will determine whether or not surgical intervention will be required. Magnetic resonance imaging (MRI) of a CT may be required to confirm the bony diagnosis or visualize ligamentous injuries. Dr. Mark Pruzansky and Dr. Jason Pruzansky, of HandSport Surgery Institute, are the tri-state’s finest hand surgeons and can help you find a diagnosis for acute or chronic pain after playing golf with advanced techniques and sport specific knowledge. Given the proximity to underlying arteries and nerves, Golfer’s Wrist should be attended to as soon as possible—by immobilization, in most cases, and surgical intervention in severe and chronic cases. Rest, splinting, and anti-inflammatory medications usually heal the problem. 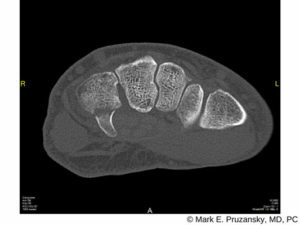 Nondisplaced acute fractures can usually be treated successfully by immobilizing the wrist with a brace or cast. For most patients, a period of immobilization followed by rehab and technique modification will be sufficient in producing long-lasting relief. If a hamate bone injury results in a nonhealing, or a displaced fracture your surgeon may recommend a procedure to get you back in your game. Drs. Pruzansky recommend that patients enroll in a rehabilitation program to maximize mobility and range of motion after the immobilization period ends. Combined with technique modification and proper body mechanics most golfers can look forward to playing golf again. Treatments utilizing splints or casts will require several weeks of immobilization as the fracture heals. Following surgical intervention a brief period of splinting is followed by rehab. Please contact us to schedule an appointment with our talented team. People experiencing hand a wrist pain ought to be evaluated to try and reduce further injury and mobility issues.